A lot of games have rules for combatants to make "called shots" on their opponent. They sacrifice a bit of their chance for success in return for the possibility of extra damage (or special effects; like "the Zorro," disarming, etc.). I've always liked these rules; indeed, I'm contemplating them for my own system that I've been working on for a year or two now. You are fighting an opponent. Both of you are armed with swords. You see his eye go to your sword arm and he begins a swing to chop it off. Is the burden on him to hit it, or you to make sure your arm is out of the way/sufficiently blocked? I see many different variations on this scenario. In the above, if we assume the swords are, say, katanas, I don't really see any difference between the defender moving his sword to block and arm shot or moving his sword to block a slash at the chest. If that is the case, why should our attacker take any difficulty penalty? It seems to me that it really depends on the manner of defense. Is the defender blocking? Then what's the difference between an arm and the chest? Is the defender dodging? In that case, I could see a penalty for hitting something as small and limber as a limb. What if they were fighting with knives? Or with Great Hammers? Or if the attacker had a katana, and the defender had a short sword? In all the scenarios, it seems like the key factor is whether the defender wants to get out of the way, or manuever to block the attack. What say the Forge? What does this mean in terms of game mechanics? It kind of works both ways, it seems, and your preference will come down to either handling issues (number of randomizers to roll) or sense of "verisimilitude." First, with regards to ranged attacks, a called shot is usually just a variation on aiming: take a bit longer adjusting for wind and range, and you have a higher chance of hitting a smaller (i.e. specified) target. Simple enough, and clearly the onus is on the to-hit roll. Second, melee--the trickier one. If the attacker is unaware, we're back to the aiming situation: sacrificing time (and, thus, risking being noticed) to insure a specific target is hit. Probably less time than for aiming at range, but time nonetheless. Now, if the attacker is aware, then the "both ways" comes into play: The attacker is focusing efforts to hit a particular target; as such, it becomes easier to defend. This limited target area could be represented with to-hit penalties, OR it could be represented with bonuses to "parry" or to "dodge" defensive rolls. You might also have variable penalties based on the size of the target: a small and therefore more mobile target would be harder to hit/easier to keep out of the way of the attack. Weapon size/speed are all orthogonal to these hit/defend considerations: a dagger attacks faster than a great hammer, whether being focused on a particular (large or small) target or not. It's an utterly separate contributing factor. Of course, there is another way of looking at the whole thing. You could build a system where previous attacks or defenses adjust following defenses or attacks. If I've extended myself for a killing lunge thrust to the heart, it becomes easier to hit my arm and head but harder to hit my torso or legs and impossible to hit my back-extended, balancing other arm. Conversely, if I've just made a basic parry against a low torso attack, I might have an easier time rolling my follow-up attack over the top, for a head hit, than I would trying to beat right back along the same line, for a torso hit (i.e. the defender's weapon is already in the general area it needs to be, to parry mine). Such a system would be far better for simulating the ebbs and flows of actual melee, and it would basically "encode" called shots into the core mechanic (rather than layering it on top): as long as you are going with "best openings," you have the best chances to hit (or defender has hardest time parrying/dodging). But as soon as you want to ignore an opening and try for a harder (i.e. less exposed) target, you incur penalties (defender gains bonuses). That's the "called shot" but it reflects current stances and positions more than mere target size (i.e. most called shot systems). And face it: in the end, every attack is trying to hit a lethal spot or is trying to hit a spot to incapacitate a limb or to knock out the victim. Body blows want to slice open a huge wound or penetrate to vital organs, every attack to the head wants it lopped off or in twain, limb attacks want that limb disabled and bleeding out. Put differently, EVERY rational melee attack is a "called shot" in the sense that a good meleer is looking for opening to make lethal blows, not just slashing in the general direction of the victim, happy to hit whatever might get in the way (mindless zombies and acre-stomping giants notwithstanding). So that's the direction I'd be heading, if I found myself wondering over the nuances of called shots as easier defense or harder to hit. A high verisimilitude combat system is going to treat each maneuver as a change in the dynamic state between the combatants, with fluctuating "best attacks" from moment to moment and no real notion of a called shot so much as a calculated delay (to aim or to wait for the opponent provide a better opening--or fool him into doing so!). Hope this helps. As a boffer meleer, martial artist, and fencer, I'd be interested in seeing a tabletop combat system that worked more like real life combat, complete with dirty tricks to gain advantages, relative stance considerations, and rick/reward trade-offs for various types of attacks or defenses. There was a martial arts CCG that basically did things this way, but I can't recall its name--it always seemed like a great "bolt-on" for an RPG that wanted really "accurate" combat techniques and reactions. With the usual "fortune at the end" systems, you have to say, before, what are you doing, and the roll simply tell you if you was successful or not. So, you have to say before the roll if you are trying for a called shot, and you have to modify the roll to take in account this. This is tricky, because in a real combat, things are not so easily divided in "called shots" and "normal shots", and this division feel artificial. With a "fortune in the middle" system, you could roll normally, deciding how much successful you are (how the events of the melee advantage you, in positioning and openings, if you prefere), THEN you decide how to "spend" this advantage you rolled. And you could decide if going for a strong hit, ot fot a less forceful hit but done with much more precision exactly where you want. This for me give a much better "feel" of the ebb and flow of combat, keeping both the uncretainty and the tactical decision. The only drawback I see, is that the entire system must be about "fortune in the middle" or "fortune in the end", this is not something that you can use only for an ad hoc rule. So I don't know how much this advice will be useful to you, without knowing what kind of system you have in mind. David already hit most of the points. Here is one design suggestion, since we're talking about you using it in your design. It's just meant to show one way it can be done that I haven't seen used yet. I think "real" attacks are always aimed. Random hit location tables, per se, make very little sense. You're always pointing your sword or gun at some part of the opponent's body. If you wanted realism, for ranged attacks at least, you could have different probabilities of where you hit depending on where the person is primarily aiming at. And the spread from the center of the aim to the other locations would depend on the skill of the shooter and the other factors involved. The old Babylon 5 RPG had something like this. Only, In B5RPG there was a silhouette of man with a hex grid on it. Like, dozens of little hexes. Attacker was choosing one of these hexes as his target, and then, if I recall, there was some deviation depending on the margin of success, and a die was rolled to determine which hex was hit, exactly. It was possible to hit air, obviously, or to hit the cover (the cover was represented by arbitrarily covering some part of the silhouette with a sheet of paper). All that to determine which point of the body got hit by the attack that most probably took you out anyway. A friend of mine tried to run the game some years ago. There was a certain gimmicky elegance to it. Also, it was as bothersome and unwieldy as a combat system can get. I've played Harnmaster, but I don't remember the different areas. Now that you say it, though, it sounds familiar. I definitely remember huge hit location lists and differently-colored damage results. If you're looking for realism, I'd have to agree with David in that the classic "take a penalty to the attack to do more damage" is not the way to go. If you wanted to make a simple mechanic that's slightly more accurate (but not perfect, by any means), then you could say "take a penalty to defense to do more damage". A defender, skilled or unskilled, is faced with the choice of how to defend. This is not often simply a matter of clutching one's stomach instinctually, or parrying every strike that aims to the face, but also a matter of stance and positioning, as well as sacrifice. Sometimes it's better to have your wrists slit than your vitals. You could, as many systems do, assume this conscious choice comes down to stats and the roll of the dice. But, especially in the case of characters who don't hold self-preservation as their highest priority, there is some level of value judgment. In the end, how important is that to your game? I.E., is the drama of your game dependent upon characters making value judgments in defense? Yes, I'm saying defense is a conscious, real-time decision on the defender's part, but do you see issues like deciding how to defend being a central and interesting part of your combat system? As a sidenote, fighting, either in reality or in a gaming system, can only be explained through a paradigm, as humans aren't capable of thinking in better ways. I suggest that once you select a single paradigm for how conflict works in your game, stick with it. The only other alternative is to have a game that takes into account multiple paradigms on how to view combat in a "realistic" manner, which could get incomprehensibly complex, but might be a fun experimental game. I'm sorry I don't have as many suggestions as the other posters seem to. I just hope some more theoretical advice helps, since you seem to be concerned about "realism" in your initial questions. If you perfected this, what would that do for gameplay? I know your going for realism, but after you got it would you say "Ah, now I have realism I can get on with doing X in the game" or is just getting realism your goal? If just getting realism is your goal, you might consider bringing in other players to help create that. Because if you did develop a really realistic system by yourself and your not going to do anything else with it, that's the end - there's no room for other players. Ha! You should see Milleniums End then, which is the "parent" system. The Babylon 5 version was the massively streamlined version! But, that's another topic entirely. In fact, if I get time later, I may post it to see what y'all think. Thanks for the advice and examples! my honest opinion on 'realistic' combat. People who talk about realistic combat in role-playing games seem to mean only realism in terms of the chances of causing wounds, and the physical effects of those wounds. i) I doubt more than a tiny number of people have any real knowledge about that anyway. ii) I'd hate for my hobbit to be wounded by a dragon in an unrealistic way. iii) Applying realistic physical behaviour, combined with ludicriously unrealistic psychological behaviour (creatures fight to the death rather than retreat, fear has no effect on people's skills, everyone has unlimited time to make split-second decisions and the ability to consult about these decisions) doesn't make anything more realistic. ii) if no one runs away, roll for who wins. iii) if you're still alive, roll 2d6. That's how many years you're going to have nightmares. Re: my honest opinion on 'realistic' combat. LOL. I utterly agree. iii) had me going for 3 minutes in the office. 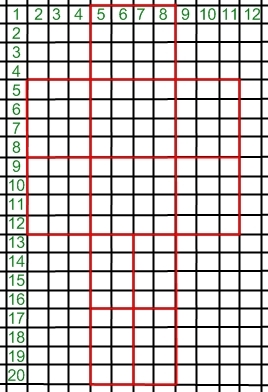 I was going to use this system for a mecha combat game long ago (before stumbling across the Forge), and I had templates in mind... rows for bursts, scatters for shotgun weapons, and so on, that you'd impose on the grid. I do think, David, that this has some worthwhile applications for a good tactical system, but we should probably take any attempts to make it such to a new thread I'm curious to see how you'd tie it all together into a resource system like you outlined.